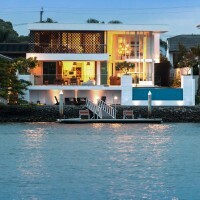 BGD Architects have designed the Promenade Residence in Queensland, Australia. Situated on an exclusive residential street, this home was designed for a family of four with the brief to achieve ideal spaces for work, rest and play. 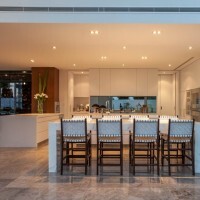 The internal planning required a clever balance to achieve a house of private spaces with maximised outlooks to the Surfers Paradise skyline. 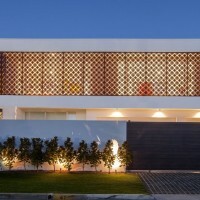 Corten steel screens wrap the first floor bedrooms providing a veil for the bedroom spaces within. 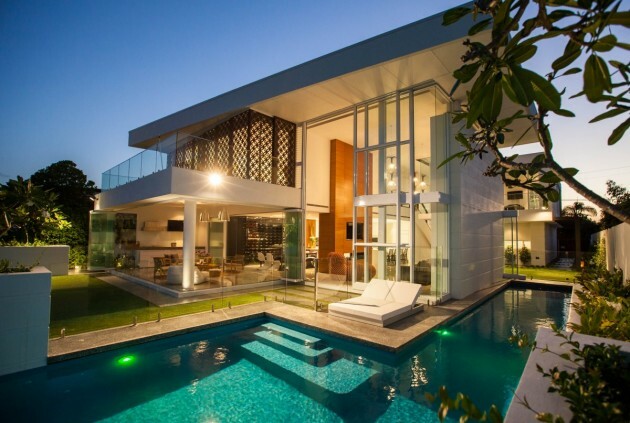 The approach to the house, presents a structured and grounded design, balanced by the delicate screen pattern and soft landscaping. At night, the house transforms to a glowing lantern. 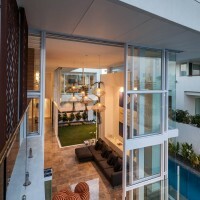 Entry via the side arbour gradually opens upon a generous internal courtyard which looks through the main living area, framing the city skyline. 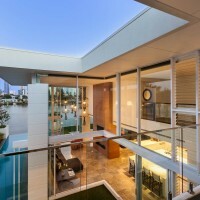 A major design feature was the inclusion of a luxury two storey space to the waterfront edge with custom double storey sliding doors. This enables views to be brought right into the heart of the house and across the internal courtyard to the street front rooms. Each layer of glazing and the waterfront screens can be pulled back almost out of sight to allow the house to breath effortlessly all day long. Louvered glazing has been utilised throughout the home to promote cross ventilation via natural breezes.